Here’s good news and bad news. The former? FX announced today that Donald Glover has made an exclusive overall production deal with FX Productions, meaning more shows from Glover will be on FX and elsewhere. So what will get you down? FX also revealed that Atlanta won’t be coming back until 2018. Glover does have to go play Lando Calrissian too, after all, and FX confirmed that the break between seasons was due in part to his Star Wars commitments. “Donald is a remarkable artist, effortlessly shifting from actor to writer, producer, director and musician to create one amazing project after another,” FX President of Original Programming Nick Grad said in a statement. “Atlanta was just the beginning, the breakout comedy of the year and a series revered as much for its originality as its honest look at the experience of being aspiring, young and black in that legendary city. We’re proud to partner with Donald in an overall deal that will allow him to continue turning his creative vision into incredible television.” Atlanta was named The A.V. Club’s second best show of 2016. 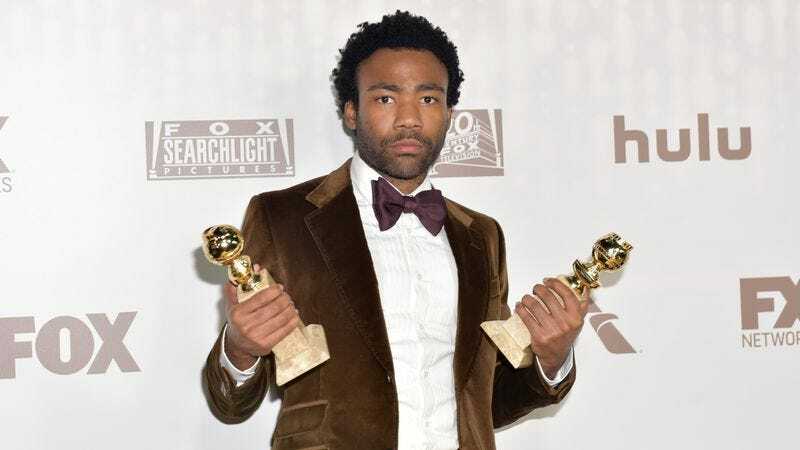 At the Golden Globes this past weekend, it won the award for Best Television Series, Musical or Comedy, while Glover took home a Best Actor prize.